I made these book bags about a year and a half ago. After making approximately 4,325 book bags, which propelled me into an extensive 12 step program....I'm baaaaaack to making book bags. Oh well, I never was good at riding in 12 step wagons. This time I brought out my paints and bags for a segment running today on Good Morning, Texas in honor of Dr. Seuss' upcoming birthday festivities. Here is the original link with step by steps, sources etc for making these no sew bags. I followed all of these easy steps, and just changed it around a bit to make them Seuss themed. I have more fun activities planned in honor of his birthday, it's the educator in me. I'll eventually post some of those projects later, but in the meantime, how about a book bag to store an extensive Seuss book collections? Here's the link to the GMT segment. 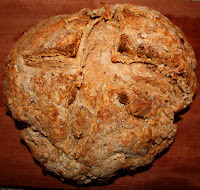 I love Irish Soda Bread, I enjoyed this recipe last year. I know it's a little early to be talking green and clovers, but.....early is the name of my game. This year I decided to see if I could merge my love of bread and cupcakes and I found a great recipe on taste of home. This was very tasty, a little less dense than the traditional bread. The carraway seeds give it a different flavor, you could leave them out if you wanted (I might next time), but....I really did enjoy them. Here's the recipe if you want baby Irish Soda Breads this year. Everythign is cute in mini. Ingredients: 2 1/4 c. flour, 1/2 c. sugar, 2 t. baking powder, 1/3 t. baking soda, 1 t. carraway seeds, 1 egg, 1 c. buttermilk, 1/4 c. butter (melted), 1/4 c. canola oil, 3/4 c. dried raisins or currants, 1 T. sugar (for topping). Instructions: Combine flour1/2 c. sugar, powder, soda, and seeds. In separate bowl combine egg, buttermilk, butter, and oil. Combine both until just mixed. Fold in raisins. Divide in 12, sprayed, cupcake holes. Sprinkle the tops evely with 1 T. sugar. Bake at 400 degrees for 15 minutes. Serve hot. I'm not a huge fan of lime, but this pie makes me change my mind. It...is...so...good. Since it's lime, and lime is green, this counts as an appropriate dish for St. Patricks' Day...and every other day in between. This is my friend Debbie's recipe, and trust me when I say, that information alone is enough to move this up any list of dishes to try. She's a fabulous chef. I decided to make it in mini versions to give out as gifts, but it works in any and every form. Keebler Sells these in six packs, and the following recipe will fill up about nine of these pie shells. I'm going to type up the recipe as one whole pie. 1. Combine first 3 ingredients. Press into a 9 inch pie plate. Bake at 350 for 10 minutes until lightened browned. Cool. 2. Stir together sweetened condensed milk, and lime juice until blended. These were little stinkers to squeeze, but aren't they cute? 3. Pour into prepared crust. 4. Beat egg whites and cream of tartar on high with an electric beater just until foamy. Add sugar 1 T at a time. Beat until sugar is dissolved and the meringue forms soft peaks (this took me about 4 minutes). 5. Spread over the filling. 6. Bake at 325 for 25 minutes. Chill for at least 8 hours before serving. I bagged and bowed these up as gifts...mostly so I wouldn't eat them all! YU-UM! I made these this week for a meeting. I'm a fan of the rice crispie treat, and I remember seeing this last year around the net. I used the same recipe. 4 cups of marshmallows, 4 T. of melted butter. Stir both in a pan until melted, and then add 6 cups of cereal. I added another half to the recipe (6 c. of marshmallows, 6 T of butter, 9 cups of cereal) so these would be a little thicker in a 9x13 pan. Use a buttered spatula to press these down. Once they harden (a few hours), cut them with a butered knife. One thing I leanred.....don't over stir or the marshmallow treats will start melting. I printed off a little tag. Everything is cutter with a tag. I love Cracker Barrell's Hashbrown Casserole, and this is as close as I've made it. It's pretty tasty, and it passed the picky testers in my world, otherwise known as my extended family. ...and what says St. Patrick's Day more clearly than potatoes? Oh...leprecauns, and rainbows?...whatever, I'll take the potatoes. Ingredients: 2 lbs frozen has browns, 16 oz sour cream, 1 can cream of chicken soup, 1 stick of butter, 1/2 c. onion (chopped), 2 c. cheddar (grated). Instructions: Grease a 9x13 pan and place frozen hashbrowns down. Season with salt and pepper. In a separate bowl melt butter and add all of the remaining ingredients except for the cheese. Pour over the top of the potatoes, and top with cheese. Bake at 350 for 45 minutes, or until warm and cheese is melted. 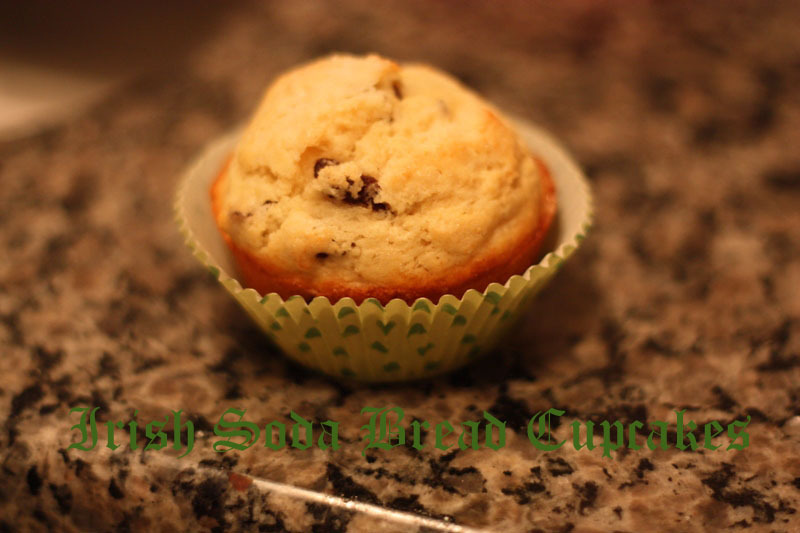 This cupcakes are super easy to put together, and really tasty if you like mints. I don't know why mints are St. Patrick-ish, but they are...you are just going to have to trust me on this because I'm the expert on all things...ummm....on all things. Period. I baked up some chocolate cupcakes. 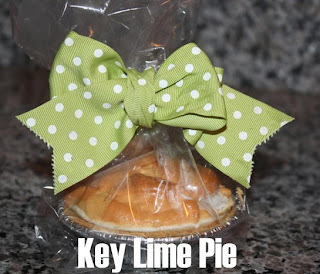 I let Betty C use my favorite homemade recipe, and in exchange, she boxes up my mix, and so it's really simple to pop them out, stir 'em around and bake them up. I whipped up some mint icing-1/2 cup butter, softened, 1 (16-oz.) package powdered sugar, 1/3 cup milk, 1/4 teaspoon peppermint oil is a recipe (from Southern Living). I ended up adding another 1/4 t. of peppermint extract, and more powdered sugar until my icing was firm enough to hold up for it's hot chocolate bath. I decided to plop it on the cupcake becasue I believe in being lazy the natural look. I put the cupcakes in the fridget for an hour to get the icing harder enough to withstand a little heat. Last, I melted some semi sweet chocolate, dipped. Cooled. ...and tried to buy the approval of friends at work that were forced invited to attend a meeting. 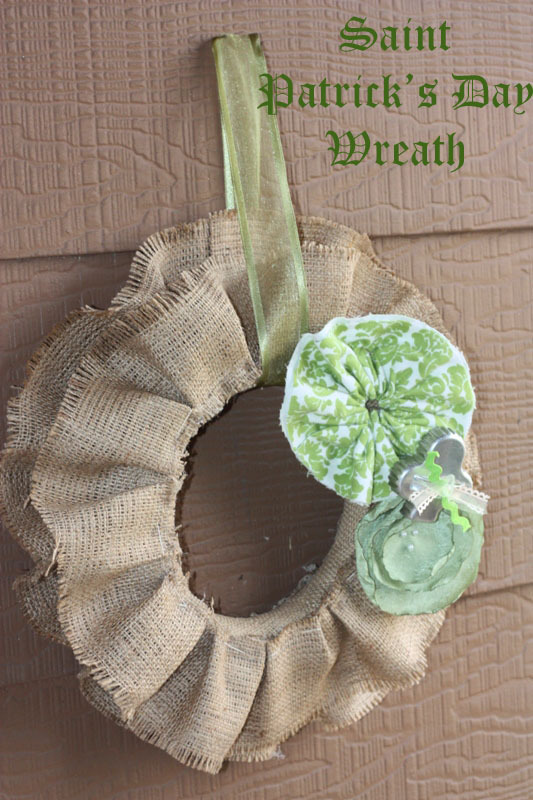 I saw this last year on Greenbean's blog and I knew I had to add it to this year's gift round up for some of my St. Patrick's Day lovin' friends. I've made dinosaur egg soap with dinosaurs in the middle, and it was a hit, so it's now time for round two. Inside these little mounds of St. Patty's Day fun is a gold dollar. I went to the bank and asked for these, and they had plenty to share. I decided to start with two bars of soap this year. The pan is a Wilton mold I bought at the craft store. I use these same guys in the oven to bake crayons. I melted 5 chunks of soap at a time (you'll do this twice) for one minute in the microwave, and it was liquid and ready to go. Add one drop of green food dye (I just used Wilton's again). You can also add a scent, but these are for kids....I don't think they care. Fill both molds with the soap, it should rise to about 1/2 way up. Let it harden (about 20 minutes) and then place the coins on top. Melt about 4 more cubes of soap, add more dye, and pour over the coin. Once these dried I bagged em up and sent them on their way. There will be gold in the middle of this....bar of soap.